Colleges and its affiliated Colleges of Sri Padmavathi Mahila University. Official website to for this SPMVVPGCET 2019 online form submission is www.spmvvudoa.in. Online applications link will be active on 22-03-2019 and last date apply online for Sri Padmavathi Mahila Viswa Vidyalayam Post Graduate Common Entrance Test 2019 is 06-05-2019. Candidates who qualified Intermediate they are eligible to apply online for Integrated PG Courses of SPMVV, and for regular PG Courses degree qualified female candidates are eligible to apply online. Written exam for this SPMVVPGCET 2019 will be conducted from 22-03-2019 to 06-05-2019. 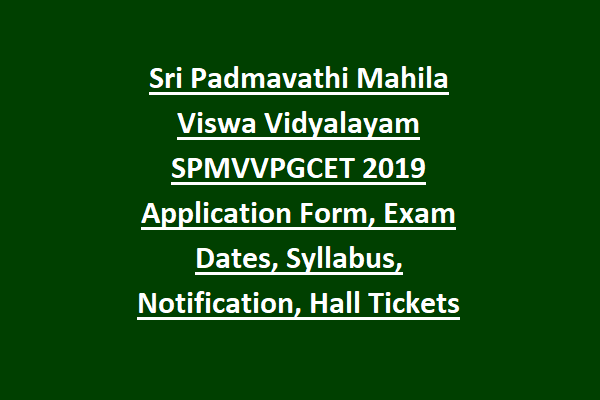 SPMVVPGCET 2019 Hall Tickets, Exam pattern, SPMVVPGCET Exam wise syllabus, and other related information about this Sri Padmavathi Mahila Viswa Vidyalayam Post Graduate Common Entrance Test 2019 is updated below. Bachelors degree or Intermediate qualified candidates are eligible to apply for this Sri Padmavathi Mahila Viswa Vidyalayam Common Entrance Test. Exam centers for SPMVVPGCET are Tirupati, Kurnool, Hyderabad, Vijayawada, Visakhapatnam. First year syllabus of 2016-17, Second year syllabus of 2017-18 and Third year syllabus of 2018-19. 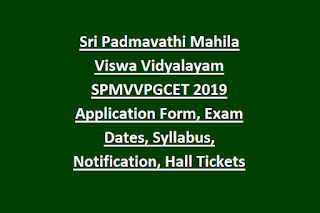 SPMVVPGCET 2019 Hall Tickets will be available 10 days before the exam date. Female Candidates who wanted to study in SPMVV they can apply online for this SPMVVPGCET 2019 on or before 06-05-2019. Official website to online form submission is www.spmvvudoa.in.